GARMISCH, Germany — It was a book reading. It was a puppet show. It was a concert. It was Oliver Pötzsch! 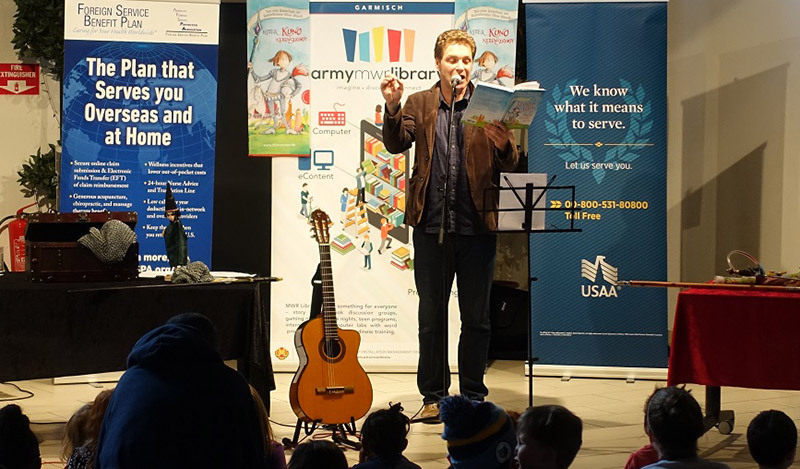 Once again, Bavarian author Oliver Pötzsch regaled the Garmisch community, with his smart blend of stories, music, and medieval show and tell. This year it was all about the Garmisch youth. Reading selections from his children’s story Knight Kyle and the Magic Silver Lance, Pötzsch entranced the crowd. Between readings, he displayed his magic treasure map, taboo swords and rapiers, a treasure chest, and his collection of playful puppets. Additionally, Pötzsch wrote and performed a few special songs, including “The Knight Blues,” which was translated into English for the first time ever. Kids clapped along to the music, pretended to be trolls, and waved their hands like trees in the wind. It was fantastic! To keep things moving, Pötzsch enlisted a couple of young volunteers to test sword sharpness and don some armor. He even solicited an adult audience member, Lt. Col. Ryan Worthan, to gauge the heft of a full chain mail shirt, weighing in at 35 lbs. The children were engrossed and the adults were amused. Overall, ‘Fun for the whole family’ aptly summed up Oliver Pötzsch’s extraordinarily engaging performance. With more than 75 people in attendance, the Garmisch Community Library was proud to host such an entertaining event!